The WMSCOG was out singing and celebrating in the streets on Dec 25, 2011 (see video below). The WMSCOG doesn’t celebrate Christmas. In fact, they claim that those who do so are really doing something pagan (fyi, Christians took the day from the pagans and made it Christian in order to stamp out a pagan festival on the same day in an effort to spread Christianity–it seems to be working). – Joo Cheol Kim, Chief Pastor World Mission Society Church of God, My Sheep Listen To My Voice p. 115, © 2000 Melchizedek Publishing Co. Ltd.
Yep, that’s right. 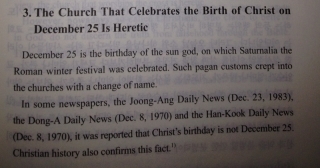 The World Mission Society Church of God held Ahn Sahng Hong’s birthday celebration (or as they call it “Father’s Coming Day”) on December 25, 2011, but their Chief Pastor says that any church who does so is “heretic”? By the way, it’s spelled “heretical” for your next version when you update the book, if you don’t end up taking it out altogether now that we’ve pointed it out to you. First, Joo Cheol Kim says “family and love” are “temptations of Satan” and now this? Sorry, WMSCOG. Looks like all that vitriol is finally showing just how much it’s worth. Just another thing that doesn’t add up. You really can’t make this stuff up folks. © 2000 Melchizedek Publishing Co. Ltd.Have something to add? Leave a short comment below, or say something substantial in our discussion forum. The “December 25, 2011” image above was inspired by the end of the video by Lee Productions, an Alvin Lee Film. I am absolutely no fan of the WMSCOG, but this item really does no credit to your cause. It would seem that they had every valid reason to celebrate 25th Dec.last year as the birthday of Ahnsahnhong – it has nothing to do with celebrating 25th December in general. If you or any true Christian were to investigate the history of celebrating Christmas and all the horrific rituals associated with this completely Pagan festival, there is no way that this is a time for celebration. The birth of Jesus would be justification for joy – yet we do not know when that was. Hello Elizabeth and thank you for commenting. What “valid reason” did the WMSCOG have to celebrate Ahnsahnghong’s birthday on December 25th? You seem to be saying that Christians are celebrating pagan festivals on December 25th despite the fact that they are really celebrating the birth of Jesus. 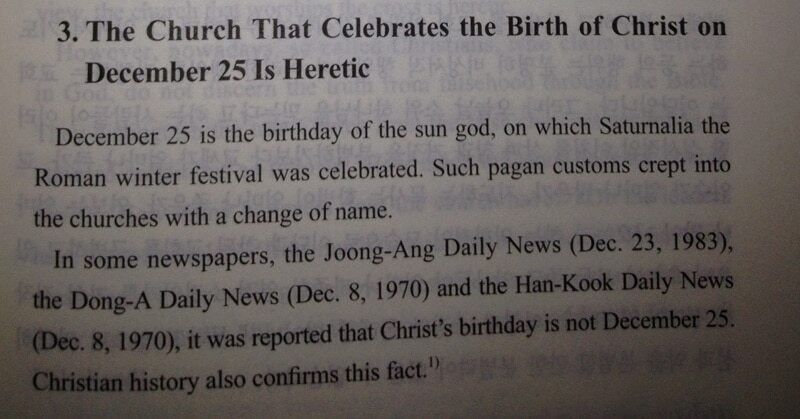 Yet you deny that the WMSCOG is doing the same thing by celebrating Ahnsahnghong’s birthday on December 25th. Christians can then use your same defense by stating that they are not celebrating pagan festivals on December 25th, but the birth of Jesus. The WMSCOG can say that they are not celebrating pagan festivals on December 25th because they are celebrating Ahnsahnghong’s birthday. And you also say that despite Christians not knowing the exact date of Jesus’ birth, they celebrate it on December 25th. But the WMSCOG does know the date that Ahnsahnghong was born, and yet they choose to celebrate it on a different day. I heard the reason was because of the so called “sacred calendar” that they use to calculate all of their other dates. That means the date would have to be different next year, but I wouldn’t be surprised if they celebrated Ahnsahnghong’s birthday on December 25th from now on. You are a complete dud.. it’s celebrated using the lunar calendar.. His birthday happened to fall on the same day as Christmas for the first time that is the reason.. wow just take down your site, it’s full of nonsense and u don’t even have any clue as to the bigger picture.. you just hate this organization because it’s flourishing when u think it should fall.. but let me just throw you Act 5:38.. Thank you G for commenting. Yes, Ahnsahnghong’s birthday fell on December 25th this past year. But don’t you think ZhangGilJah should have told your general pastor not to write what he wrote because 21 years later Ahn’s birthday would fall on that date? I guess your “god” wasn’t paying attention. Maybe this book will undergo some revisions too. A little presumptuous of you to think that Acts 5:38 applies to the World Mission Society Church of God. If a Jehovah’s Witness or a Mormon pointed to that verse and told you that they were the true church, would you believe them? I watched most of your videos and stuff but see it never convinced me atall… Before criticizing the true church, Why don’t you prove Yourself true christian based on the Holy bible, rather than perishing man’s standards. LET ME TELL YOU ONE THING, NO ONE WHO BELIEVES BIBLE ABSOLUTELY WILL NEVER BUY YOUR EVIL HUMAN IDEAS. December 25 WAS Ahnsanhghong’s birthday by the Chinese calendar (the one also used by Korea) and by the way we have celebrated it EVERY year based on that calendar if you care to know. Actually you just said the reason I was going to give. I was told that because of the 360 days (least I think that’s the amount of days) a year calendar that it ironically just so happened to fall on December 25th this year. I think he meant every year because if one goes by that calendar it’ll eventually fall on every day of the year after enough time has passed. I think that it should fall on about the 21st this year based on that…or maybe the 20th since this is a leap year. However we’ll see what happens this year. Right. It’s odd that people can understand the idea of PO moving around on our calendar but not Ahn’s Bday. The church that celebrates the birth of Christ on the 25th of December is a heretic… What is the context of this sentence? This is talking about Jesus, the Christ in His 1st coming. This is also the conclusion of all the evidence available that shows 12/25 as Jesus’ birthday (every year) has pagan roots. Meaning, this celebration did not come from God. Why didn’t Zahng tell GP not to write that sentence?….. Because it’s fine the way it’s written. Just like the WMSCOG does rather often, that sentence was taken out of context. 12/25 is not the birthday of Ahn. Ahn birthday fell on 12/25. Being that Americans use the Gregorian calendar, it isn’t alarming to hear member’s say, 12/25 is Ahn’s coming day! But that only applies when it lands on that day. This year, 2014, one cannot say 12/25 is Ahn’s coming day. (Why?? They said it in 2011!) Because it doesn’t fall on 12/25 this year. This article, IMNSHO, is no good. WMSCOG is from Devil. Please Read Romans 6:9 and then check your Ahn San Hong. Excuse me sir, but WMSCOG is not from the devil. Your understanding from reading Romans 6:9 is incorrect. So please, read the Bible more so you can understand. And we, World Mission Society Church of God, we believe in God the Mother who is testified in the Bible. Galatians 4:26, Genesis 1:26. Genesis 1:26~ When we see God create mankind, God did not say, “Let Me make man in my image,” or “Let there be man.” God clearly said, “Let Us make man in Our image, and in our likeness.” But people think the “Us” means thew trinity or the angels. But it’s not. Because if the angels formed Man in their own image and likeness, angels would pop out. And if it was the trinity, okay wait hold up. Actually the trinity are not all 3 different men. They are the same. It’s the same God. It’s just he came to this Earth with 3 different names- for the 6,000 year work for redemption. Jehovah was the name of the savior in the age of the Father, Jesus was the saviors name in the age of the Son, and Christ Ahnsahnghong, was the Savior for the age of the Holy Spirit, which is in this age but he already came. And that was his second coming. He was born in 1918. And when he was baptized in 1948, as the parable of the Fig Tree was fulfilled ( When Jesus cursed the Fig Tree which was a parable). The fulfillment of the Fig Tree in 1948 was when Israel became it’s own independent state- which is when Christ Ahnsahnghong was baptized and began the gospel work. SO since Christ Ahnsahnghong is the Second Coming Christ, he already fulfilled his Second Coming. So very soon, very very soon, God will come and bring judgement on the Earth and will take his Children back to the kingdom of Heaven. So that is why our Church is called ” World Mission Society Church of God” because we are trying to save the world and have everyone believe and obey God the Father and God the Mother and keep the Passover- and all of God’s feasts and truths so that we may all enter the Kingdom of Heaven. but people persecute us because the same exact prophecy is being fulfilled, the same prophecy that God’s children will be persecuted because of his name. As Jesus was persecuted in his 1st coming along with his followers, when he comes a 2nd time, he will be persecuted and so will his followers- the Ones who will be saved in the last day- be persecuted. Thank you. the people who celebrate Christmas is a bunch of heretics, but those who celebrate Ahnsahnghong supposed birthday at the same date were the right bright ones, now since wms claimed ahnsahnghong as jesus V2…. whats the difference then between the wms and the rest of the heretics? don’t generalize please. i am from the church of God but i don’t call people who celebrate christmas as heretics. they just don’t know what it stands for and it’s understandable because people don’t tell them. Hello fromphil, just wondering…the statement about heretics is a direct quote from the general pastor. Are you saying that you disagree with him? then why the hell your leader tells this so? I asked that exact same question KC. They always have a perfectly logical explanation for whatever they do. The pee ons never answer a direct question like that. They always re-direct to the Pastor or second in command. Then when they hear the official excuse from the horses mouth, they fly with it. Like the video justifying the New Jerusalem Book. It took them a while to come up with that one. LOL It was so much fun to watch them scramble and get nervous. Priceless when they get busted the crap they come up with. Now it’s right. LOL. He’s Jesus, of course he was there. Aahnsahnhong is the holy almighty god who came in flesh as per bible prophecy. Very danger brothers.. Don’t even say a word against wmscog.. Firstly come to our church without hesitation brother. Hear the prophecy.. Realise the truth.. Then say anything as you wish for your fate.. Very danger to speak Against the holy spirit.. Because the words against holy spirit never forgive.. So please brother.. See the prophecy .. Come to our church. Spent just 1hour in your whole life.. Instead of wasting your time on replying against me come to our church save the time for your soul..
Internet is not the way to realise truth.. The bible is the only way.. Internet are danger.. Satan’s weapon… Only through the bible we can see god brothers.. So please come to our church.. See the God’s word instead of Satan’s word’s in net..
Paul, I don’t care how you find your information as long as you do your own outside research. What I mean by outside research is that you get out from under the influence of the group so that you can discover things for yourself. So far it appears that you have been letting this group tell you what is right and what you should believe. You are not unlike many who have posted here before you so don’t feel bad. I’m afraid that most of you have never taken the time and effort outside of this group to discover if what you have been taught is the truth or not. Unfortunately most people just get spoon fed this doctrine and never take the time to learn what this group is really about before they devote their lives to it out of blind ambition. It works out great for the group controlling the individual but for the person giving up their lives for months even years it’s not advantageous. Take the time to do the research and don’t let anyone interrupt it! I don’t care where you get the information from just make sure it is credible and NOT from the group that has an interest in keeping you under their control. It’s true, WMSCOG doesn’t want their members to go on the Internet. the free speak on the net cannot be controlled. and members do leave the church as a result. i’ve heard that some churches have even gone as far as saying that there is an evil spirit in the Internet. But come on, let’s not be deceived by such words.i think it’s just the control of the church talking. @T H. Just wondering. Did we find out whether Heavenly Mother passed away? I think she did actually. But it’s not acknowledged openly by the church. (it’s still covered up, hidden secret).